When you go about doing a makeover or remodel, be sure to use the right materials and do the best job you can, realistically. Saving is a great idea, but be sure not to save money at the expense of architectural stability. It’s very likely that by being considerate and thorough, you can bring yourself exceptional capital in the realm of opportunity. Almost universally, making over a home from the inside out is a great way to increase the value of your property. There is an entire family of home makeover programming on the Home & Gardens channel. Some shows feature a family purchasing a home which offers them the best value for the least investment. Certainly, there are sacrifices to be made on both sides; but from the acquisition of the property to its eventual remodel and sale, such programming demonstrates the possibilities open to individuals who are willing to put in the work and the time. While the property you own may not be one you purchased with the intent of “flipping”, that doesn’t mean you can’t fix it up, and actually end up injecting more value. In fact, this is a great first step toward making serious money. Consider some figures: a home worth $300,000 that undergoes a substantial remodel at $20,000 (which would likely involve hiring contractors) may increase in value by $100,000. Now, if you can sell that property for the full $400,000, provided the neighborhood is requisite to the asking price, or at the very least featuring amenities that fit the bill, you can go into the market $100,000 richer. Now say you’re headed for a new community. You can purchase two properties that are less expensive. Live out of one, rent from the other. Such a Passive Income Generator, or PIG, would allow you to live in a new community without need for direct employment. With the other property giving you a monthly income, you’re free to pursue those things most central to you. Things like being with your family, or creating. Oftentimes as life progresses people develop a fondness for gardening, or woodworking, or crafting, or needlework. What about music? Writing? Dance? Singing? Cycling? How about travel? Imagine selling your home for $400,000, purchasing a rental property with a basement unit for when you’re not on the road, and putting the rest in an RV? You could make that work real well indefinitely and keep the family with you, if you’re frugal. The point is, a little input can yield exceptional output. Though you have to spend money to make money, if you take a sober, reasoned approach to the makeover, you’re likely to reap substantially on your investment. One easy area where a makeover stands to expand value is a simple bathroom remodel. Maestro Bath offers a line of faucets and other accessories that are chic, expensive, breathtaking and full of value. When you go the makeover route, provided your installation of materials is conducted carefully and well, it’s not untoward to expect a five-fold increase in value. That is: if you spend $20 on just the right shade of paint, with just the right gloss to cover that particular region, you may have just added $100 to the value of your home. Consider the difference between blank walls and an engaging color scheme. Even if a prospective buyer has designs on redecorating after their initial purchase, the impression a well-maintained area gives will naturally increase the value of your property in their estimation. 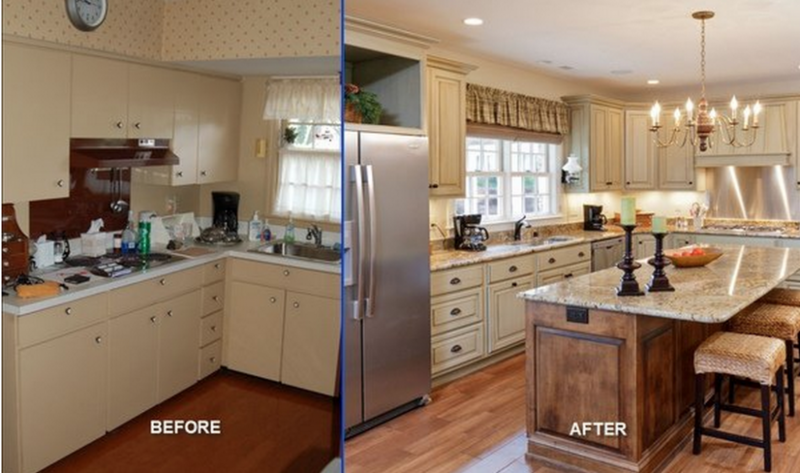 The kitchen makeover is amazing! I would love to makeover my kitchen like this one. I will be checking out the Home and Gardens channel to see what they have to inspire me.